I just finished presenting with Scott at the 2019 PressED conference! PressED is a conference “looking into how WordPress is used in teaching, pedagogy and research. The conference happens solely on twitter.” Here is the document we used to construct our “talk” – it was SUCH an exciting experience, from constructing our narrative to the actual copy/pasting/posting of our tweets. Below you’ll find a “moment” with our presentation – and be sure to follow the #PressEdConf19 stream today – incredible work and conversations being shared!! I’m on the plane ride home from an amazing experience at #OER19. In thinking of what I could write to recap – I thought I would share a story I’ve been sitting on for a few weeks. Inspired by Kate Bowles’ use of the powerful metaphor of a quilt in her incredible keynote and, the discussions I had with several colleagues around open teaching practices – I’ll begin laying out the patchwork. On July 11, 2016, I was in class with Debbie. I think it was the end of the third week of our intensive 4 week Master’s in Educational Technology program. Over the week the students had to create an “i-Infographic” for an audience. In our program we always encouraged and supported our students to publish and share their important work with the world. I clearly remember Debbie coming up to me and having me read her (awesome) blog post – she was filled with a sense of worry and trepidation about putting her work out there in the open. I reassured her – and ultimately she courageously hit “publish.” And that’s where the story of the Twitter 4 Teachers infographic begins. Debbie’s infographic has been continually “going viral” since 2016. 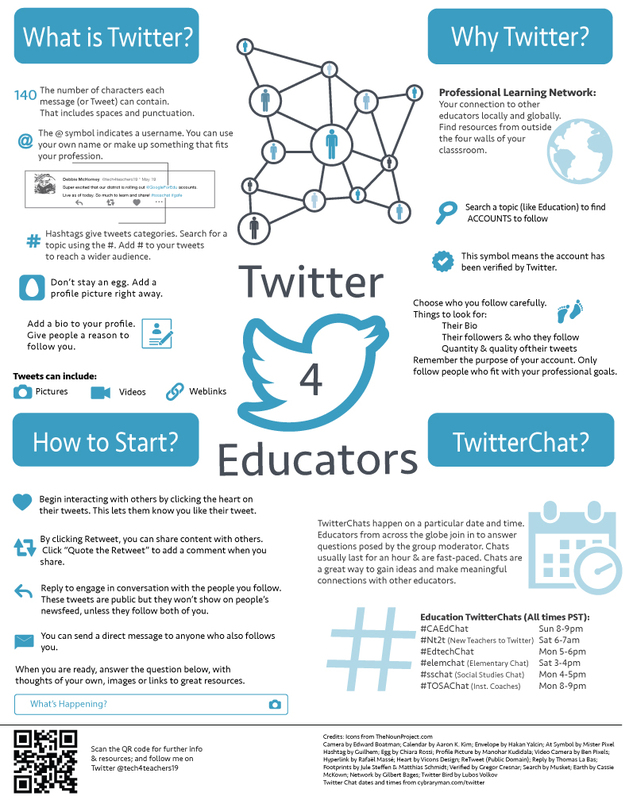 If you do a quick google image search for “Twitter 4 Teachers” (the title of the infographic) you’ll see hits from around the world – teachers/educators/administrators who have used her (Creatively Commons licensed) graphic . Over the years she would share tweets with me or messages from other educators who had found her infographic and shared out they were using it in their context. It turns out Marc (in Germany) had found Debbie’s infographic, and remixed it into German. If you use #twitterlehrerzimmer you‘ll find a lot of pics by teachers who printed the paper an pinned it in their schools – all over Germany. So now, Debbie, Marc, and educators across Germany are all connected – because Debbie took a risk to be open, because our pedagogy & curriculum supported and encouraged open, and because Marc is an open practitioner and embodies the ethos of remix/reuse/share. Since all the layers of this experience were open, the story above is rich with hyperlinks of evidence – digital trails, timestamps and artifacts that can be stitched together – into this new quilt. It was an absolute honor to return to the School of Education at NUIG this past Monday to share thoughts on Design Thinking & Blended Learning Design for their Research Seminar Series. I’m truly lucky to have such wonderful connections and colleagues at NUIG – I appreciate my “old” friends who came to the table, and the new ones I met this time around! A special thanks to Tony, Cornelia & Gerry for this opportunity. I’m sharing my slidedeck below – it was just a brief conversation starter, and, then we had the luxury of having a good chat and poked some holes at design thinking and blended learning efforts. Thanks to all of you who pushed my thinking – and I’m looking forward to continued conversations and collaborations. Below you will find a recap of my sessions (with the associated slides/handouts.) All of the collaborative notes from the both conferences can be found: APDX Notes, IPDX Notes. You can also cull through the conference TAGS twitter archives by visiting #apdx19 and #ipdx19. Design thinking (DT) has infiltrated many of our PD/PL sessions, but, often we’re left cleaning up post-it notes with no real plan for action. This session takes a critical look at DT and provides an opportunity to practice sustainable DT. There were some fantastic notes and suggestions brainstormed during the session which you can find here. At times it feels as if the conversations and sessions are repeating themselves – are we truly making progress? This session will be a rapid series of critical provocations between participants culminating in idea generation and challenges. Here are the discussion questions along with critical questions brainstormed during the session. Using Mozilla & Tactical Tech’s Data Detox as an intervention, this session will be an interactive detox and an entry point into discussions about ethics and digital literacy. This workshop is an intense refresher (or introduction) into educational technology theories (new and old.) Participants will create an #iPDX19Syllabus of resources to share with the conference community. I have tried to share my story publicly so others know they are not alone. I am here to help connect you to resources that have helped me (specifically here related to endo, ostomy or wound care!) I have tremendous respect for my doctors and nurses – for their training, for my ability to access world class care due to our health insurance. Being confronted with these medical and health challenges first hand brought many things into sharp focus. I’ll do my best to continue to advocate and donate so others who are also faced with these challenges have the same privilege and support that I have had during my journey. While all of my personal challenges were presenting themselves, I went through the process of applying for – and getting – a new job. 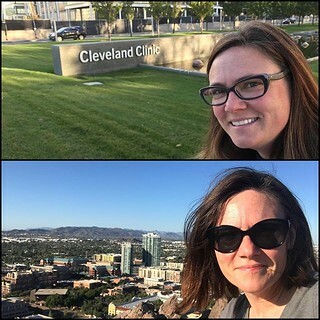 I resigned from MSU in June of 2018 and started as a Clinical Associate Professor at Arizona State University in August of 2018. My first semester was incredible – I’m so happy to be teaching again. I’m working remotely from Michigan and visit Tempe a few times per year. Ditching my 120 mile/day commute has been life changing. I have reclaimed about 15-20 hours/week, time I can funnel into – anything! I have missed daily interaction with colleagues face-to-face, however, I have been co-working with some amazing friends around town which has helped fuel my creativity & energy. I’m proud of my academic publishing and presenting record this year – though it was not as voluminous as it has been in the past, I still was able to produce scholarship (with amazing friends and colleagues) despite my physical challenges. Wolf. L. (October, 2018) #CPED2018 – Constructing a collaborative convening “syllabus”. Learning exchange presented at the meeting of the Carnegie Project on the Education Doctorate, Glendale, AZ. Buss, R., Henriksen, D., Mertler, C. Rotheram-Fuller, E., Wolf, L. (October, 2018) Leader-scholar communities (LSCs) @ ASU: Lessons learned, lessons shared, lessons inspired. Learning exchange presented at the meeting of the Carnegie Project on the Education Doctorate, Glendale, AZ. Buss, R., Henriksen, D., Mertler, C. Rotheram-Fuller, E., Wolf, L. (October, 2018) Growing into change: Moving from F2F to online in a doctoral research conference. Learning exchange presented at the meeting of the Carnegie Project on the Education Doctorate, Glendale, AZ. Dousay, T. A., Wolf, L., Santos Green, L., & Asino, T. (2018). Rise of the “Teacher Influencers”: Examining the benefits and conundrums. In Society for Information Technology & Teacher Education International Conference (pp. 973–975). Washington, D.C.: Association for the Advancement of Computing in Education (AACE). Marciano, J., Wolf, L., Oviatt, R., Tunstall, L. & Varrichione, A. (2018). Creating community in online courses: A case study examination of instructor practices. In E. Langran & J. Borup (Eds. ), Proceedings of Society for Information Technology & Teacher Education International Conference (pp. 214-218). Washington, D.C., United States: Association for the Advancement of Computing in Education (AACE). Wolf, L.G., Marcotte, C., Kosko, M. (2018). The Quickfire Challenge Roundtable: How to fail fast & learn while having fun. Roundtable presented at the Society for Information Technology and Teacher Education conference, Washington, DC. Hagerman, M.S., Wolf, L.G., Woods, H. (2018) Educational technology programs, evaluation, and transformation. In Smith, B., Ng-A-Fook, N., Radford, L., Pratt, S.S. (Eds), Hacking Education in a Digital Age: Teacher Education, Curriculum, and Literacies. Information Age Publishing. I’m working on my 2019 goals (both personal and professional.) I’m elated to be returning to Ireland for #OER19 and have some exciting writing and presenting projects in the works. I’m also looking forward to continued growth – continuing to listen, continuing to learn. My friend tagged me in this very happy memory today which brought me great joy. Seven years ago, I livestreamed my dissertation defense. It was completely natural for me that the culminating moment of the dissertation journey would be open. I “exposed” my dissertation file before defending, I’d been blogging regularly since 2004, my practicum was (is?) 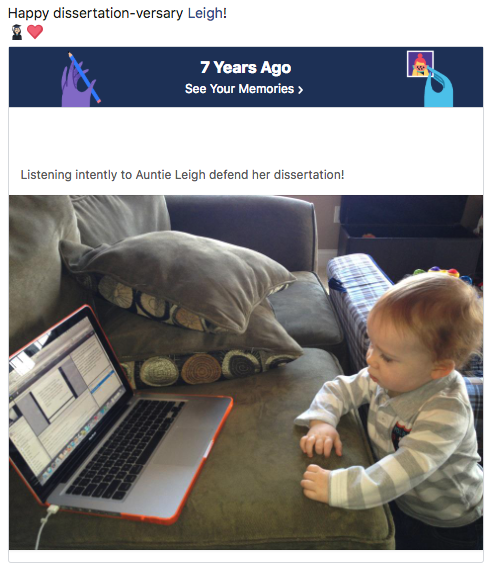 a blog, I tweet – heck yes I was going to stream my dissertation! My committee was (I think somewhat hesitantly) agreeable (though the discussion of the results would of course have to be closed!) I think they were somewhat surprised when about 25 people showed up in person…and about 40 or so more online. While I was full of the requisite nerves, I was determined to approach my defense as a celebration, a community celebration. About 4 years prior to this moment, I failed my dissertation proposal defense. It’s not a secret, but, not something I’ve really ever talked about openly before. This was one of those pivotal moments which I know fed into my personal desire to open up these “closed” processes of academia. Had I been able to attend a proposal defense before my high-stakes moment, maybe I would have done better? (We could talk a lot more about that experience, but, let’s move on…) By opening up my dissertation defense, a bunch of sweet little kiddos got to watch (a woman) achieving a dream (in person and online). Fellow graduate students were welcomed into a space that is normally not open/welcoming so they could get a glimpse of the process. I was elated that the college support staff I invited were there, there is no way I could have completed my PhD journey without them. My students (many of whom watched from around the globe) got to see their teacher and mentor “on the spot.” My own dear teachers and mentors (from K12 onward) were also able to attend from afar. Since I’m back in the classroom now, I’ve been thinking a lot about how to (re)articulate my own philosophy of teaching and learning (things like this are resonating with my thoughts). Open is still at my core, and I’m inspired to continue sharing and working on, and in, open pedagogical spaces. I had a wonderful time this afternoon meeting with dedicated educators across Canada who are members of the #LNDLCA community. My dear friend Dr. Michelle Schira Hagerman extended the invitation as a part of her groundbreaking work leading the The Canadian Institute for Digital Literacies Learning. Below are a few artifacts from the session (thanks for the tweet Michelle!) – I’ve embedded my slides and the original invitation to the webinar. I look forward to continued conversations and connections via the #LNDLCA hashtag! 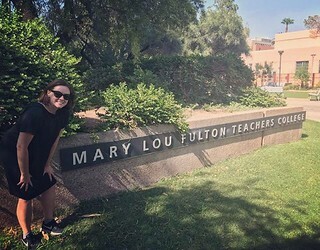 Dr. Leigh Graves Wolf is teacher-scholar and a Clinical Associate Professor in the Mary Lou Fulton Teachers College at Arizona State University. Leigh teaches with the Educational Leadership and Innovation EdD program and is a faculty fellow with the Office of Scholarship & Innovation. Her work centers around online education, K12 teacher professional development and relationships mediated by and with technology. She has worked across the educational spectrum from K12 to Higher to further and lifelong. She believes passionately in collaboration and community. Leigh shares her work at www.leighgraveswolf.com. We invited Dr. Wolf to share her expertise with us because she is a creative, innovative teacher, scholar, and leader who, over the past decade, has leveraged design thinking frameworks to lead massive institutional change projects at the macro-level, and to create daily lessons for her own students at the micro-level. 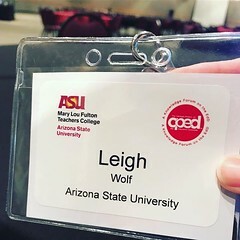 Leigh has offered to share her current thoughts about design thinking — which, despite being a bit of an educational buzzword — is worth understanding as a powerful framework for the design of theoretically and evidence-based classroom practices in every discipline. This session will take place from 4PM to 5PM on Wednesday, November 28th, 2018. Please join us! The webinar will be hosted using Zoom.us. You can attend from the comfort of your home, on a laptop or via the Zoom app on your smartphone. This proposal seeks to develop two learning modules for global educators, both inservice educators and preservice educators who have reached the field placement portion of their program. These modules will be available to teacher candidates and practicing teachers anywhere and will engage participants in two areas of global education practice: the first module (for elementary educators) will focus on developing competency in global project-based learning curriculum design, and the second (for secondary educators) on integrating global citizenship education into the teacher participant’s subject area. These modules will consist of a combination of online learning and collaboration, specific classroom projects, and preparation of curricular units and lessons. The design of the learning modules will center around the development of competency in one area of global teaching (project based learning/global citizenship education) and not, as is common in other forms of professional learning, the completion of “seat time” at a workshop or presentation. In addition to receiving continuing education credits, teacher participants will, at the successful completion of the learning module, be recognized for their competency with a digital credential. This digital badge will be available for teachers and teacher candidates to display on their LinkedIn or other social media profiles to communicate their expertise in this area of global education. Teachers will also receive the badge in the form of a vinyl cling to display outside of their classroom door. The modules will be developed by a team of colleagues from Michigan State University’s nationally recognized teacher preparation program and K12 global educators and education leaders to meet the specific needs of practicing global educators and global educator teacher candidates. The purpose of the project is twofold: 1) we seek to develop and deliver two global education micro-credentials to practicing teachers and teacher candidates; 2) we seek to develop a framework for the learning pathway, technical infrastructure and administrative infrastructure for managing, reviewing and awarding digital badges for global education so that future credentials may be developed and implemented. It is our goal to ultimately develop and deliver a range of micro-credentials for a variety of competency areas for the global educator. I had SO much fun editing the podcasts (it was great to get back to my audio production roots) and I learned a lot about publishing to iTunes! I finally have a moment to reflect on my first Carnegie Project on the Education Doctorate (CPED) conference. It was wonderful to have the opportunity to learn more about the EdD community of which I am now a practitioner. CPED is the knowledge forum on the EdD. With a membership of over 100 schools of education in the US, Canada, and New Zealand working collaboratively to improve professional preparation in education at the highest level. The LSC session above was livestreamed and we experimented with remote participation via Zoom & a google doc. Hopefully the recording will be available and I’ll update the post with the link. If you follow the link above, you’ll see the text of my full proposal – along with the notes from our session. It was a small group (6 of us total) and our discussions centered more broadly on social media use/professional use of social technologies (including Wikipedia, ResearchGate and Academia.edu). This discussion gave me quite a few ideas for future blog posts, course content creation, and conference presentations! While at CPED, I saw an opportunity to help to grow the CPED online community. Below is the text from a communication I wrote for the CPED email list and I’m looking forward to helping grow and support the network any way I can. Thank you to all who shared their thoughts on Twitter during #CPED2018. Over the past few years the use of Twitter to share CPED ideas has started to grow. This year, we started tracking the Tweets and an archive can be viewed here. We want to highlight a two “strength of weak ties” (Granovetter, 1973) moments that were created on Twitter during the conference. First, in sharing the links to the award-winning dissertations, a tweet gained 3 likes and an encouraging response from a connected scholar in Ireland. Second, a tweet which featured the “Marathon Map” shared by our ECU colleagues – spurred a flurry of 12 likes and 6 comments. We want to highlight these specific interactions – not to start a popularity contest, but rather, to demonstrate the power in sharing our work and ideas beyond the conference walls. To further promote the use of social media, an experimental session on the final day of the conference attempted to create a #CPED2018 “Syllabus” of resources based upon the twitter and social streams. As a Community of (online) Practice we’re still growing in this area and the Twitter stream provided an emerging set of resources (which you can see in the nascent form here). Our session ended up being a robust discussion of social technologies (e.g. Twitter, Wikipedia) and how we can start to use them more strategically in our CPED workflows our professional practice. This lively discussion planted seeds for future opportunities for professional growth and development and we encourage you to stay tuned to CPED announcements for those opportunities. In the meantime, we would like to continue this momentum as we look forward to #CPED2019. If you have ideas/links/resources you would like to share between now and the next convening – please use the #CPED hashtag when Tweeting. This will allow our community to connect and grow virtually between convenings. If you’re not sure about Twitter, you can always “lurk” by following this link #CPED to see the most current stream of Tweets by those using the #CPED hashtag. By sharing we’re fostering a Community of (online) Practice and allowing others outside of our CPED community to connect to us as individuals and connect collectively to the great work we all doing.